This apartment is part of a stunning renovated farmhouse in the heart of nature! There is a swimming pool with beautiful views where you can enjoy the sun and take a refreshing dip. The enclosed area is part of an enormous natural reserve (600 acres). The apartment is smartly decorated and has a private terrace with seating. It is located on the ground floor. There is a communal area with TV, table soccer and games for kids. You can also use the shared washing machine and BBQ. Hop on the available mountain bikes and explore the exciting surrounding area! You are only 8 km away from the beautiful town of Città di Castello. Also a perfect place to do your groceries or visit the post office or the bank. Don't miss out on the other medieval villages and towns in the area which are well worth a visit: Monte S. Maria Tiberina (20 km), S.Giustino (20 km) Citerna (25 km) Sansepolcro (30 km) and Arezzo (40 km). 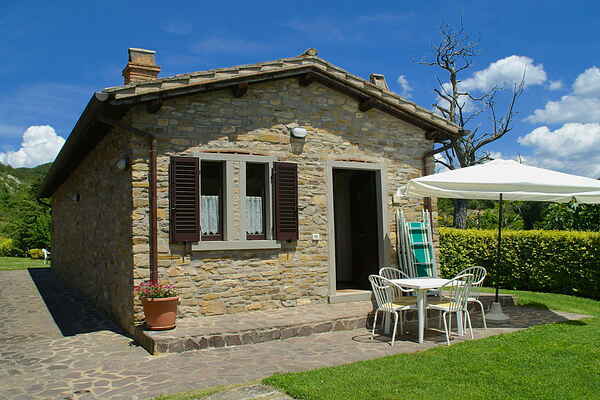 After all, you are located in an area bordering 3 regions: Umbria, Tuscany and Le Marche. In short, no need to sit still, but you're welcome do so, if you prefer!